VYSHOROD, Ukraine -- It was supposed to become a Museum of Corruption, a triumphant trophy of Ukraine’s February revolution and a monument to its new leaders’ determination to uproot the lawlessness and avarice that blighted this country’s first two decades as an independent nation. 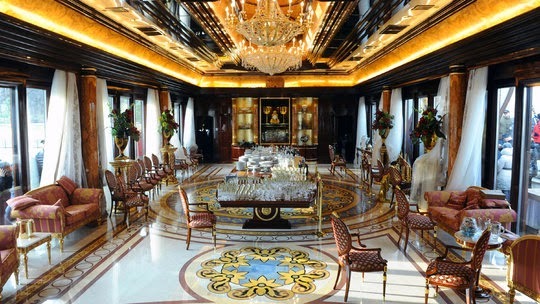 More than six months after protesters drove President Viktor F. Yanukovych from power, however, his lavish estate on a forested bluff north of Kiev, the capital, displays how difficult it is to bring real change, as well as a dark warning that Ukraine’s troubles reach far beyond the war zone in the east of the country. “This was the main symbol of our revolution, our Bastille,” said Yuriy Syrotiuk, a member of the Ukrainian Parliament who, a day after Yanukovych fled Kiev on Feb. 21, drafted legislation that ordered the gigantic property transferred to the Ukrainian state. But instead of joining the former Paris prison as an emblem of a decisive break with the past, Yanukovych’s palatial residence, tennis courts, golf course, personal zoo, helicopter pad and acres of landscaped gardens are now “a symbol of our state’s inability to function normally,” Mr. Syrotiuk said. His draft legislation, swiftly adopted into law on Feb. 24, mandated that Yanukovych’s estate, a property of almost Versailles-like scale and excess, be taken over by the state within 10 days. That still has not happened. That plan sank in a swamp of legal confusion and squabbling over control of Yanukovych’s opulent hideaway and its contents, estimated to be worth over $1 billion in all, including gold bathroom fixtures, a white Steinway grand piano and a menagerie of exotic birds, deer and other animals. In the confusion, the whole lot has fallen under the control of Denys Tarachkotelyk, a burly former businessman and now the self-declared “commandant” of a 350-acre estate, nearly twice the size of Camp David. The boss of a small transport company who supported protests in Kiev’s Independence Square, he arrived at Yanukovych’s Mezhyhirya residence on the morning after the president fled and somehow managed to outmaneuver rival revolutionary avengers to gain control of the entire property. Supported by a group of former protesters from Independence Square and now by volunteer fighters back from the war in eastern Ukraine, he has kept would-be looters and vandals away and, arguing that corrupt bureaucrats only want to enrich themselves, has steadfastly resisted government orders that he hand over his domain to a state-owned agricultural company. “Lots of people want to take it away. They are playing the same old game,” said Mr. Tarachkotelyk, speaking on the veranda of his office, a luxury guest villa known as “Putin’s House” because of rumors that President Vladimir V. Putin of Russia stayed there once during a visit to Kiev. But while fuming against greedy, inept politicians and officials, Mr. Tarachkotelyk has himself been besieged by accusations of thievery and incompetence. “Who is this person? He is a nobody,” said Mr. Syrotiuk, the legislator. He described Mr. Tarachkotelyk as a “numbskull” and said his principal goal was to keep control of the cash flow generated by ticket sales to visitors. On one point, however, all sides in the feud agree: Ukraine’s February revolution is far from finished and needs to deliver on its promise of a clear, fresh start to avoid going the way of the so-called Orange Revolution of 2004 that generated high hopes and then fizzled in a morass of infighting and corruption. The bloody military campaign in eastern Ukraine against pro-Russian rebels, now in abeyance after a cease-fire agreement, has helped to keep frustration with Ukraine’s new leaders and their tycoon backers in check. And even their most fervent critics acknowledge that President Petro O. Poroshenko, a wealthy businessman elected in May, has avoided the larceny associated with Yanukovych. But alarm bubbled to the surface last month when Tetyana Chornovol, a prominent supporter of the protests in the Kiev plaza also known as Maidan, announced that she was resigning as head of a new anti-corruption agency. “Maidan has not purged us. It has just become the beginning of a difficult path,” Ms. Chornovol, whose husband was killed recently in fighting against rebels near Donetsk, wrote in an anguished article explaining her departure. The economy minister, Pavlo Sheremeta, has also jumped ship, frustrated with the slow pace of economic reform. Many Ukrainians blame Putin, saying his principal objective is keeping Ukraine in an uproar and so prevent its new leaders from meeting the hopes of change raised by the Maidan protests. But another problem is that just about everyone other than the pro-Russian gunmen in the east proclaim themselves guardians of the revolution, a role that can provide easy cover for narrow personal ambitions. Mr. Tarachkotelyk says he has used money collected from ticket sales not only to pay the salaries of 145 staff members but also to buy helmets, bulletproof vests and other equipment for soldiers fighting the separatists. He also boasts of buying food to feed scores of fighters now recuperating on the estate as well as around 80 refugees from Donetsk and other parts of the war zone. It costs just over a dollar to enter the estate but around $15 for a guided tour of Yanukovych’s palatial villa. The number of visitors has fallen sharply since February, when hundreds of thousands rushed to gawk at the former president’s excess, but tens of thousands still visit on weekends, marveling at Yanukovych’s execrable taste and generating substantial ticket receipts for Mr. Tarachkotelyk and his men. More money comes in from food stalls and tour operators, but how much exactly, and where it goes, is unclear, as Mr. Tarachkotelyk sees no need for outside auditors. The government, he said, has no right to inspect his accounts. “We account for ourselves before society,” he said. He dismissed as lies a swarm of allegations surrounding his management. These include reports in the Ukrainian news media that he or his supporters stole a big loaf-shaped bar of gold left by anukovych in his study and pocketed money that should have gone to buy food for hungry animals in the former president’s zoo. The animals now all look well fed, and Mr. Tarachkotelyk says he is the victim of a defamation campaign by those who want to seize the presidential estate for their own purposes. The gold bar, he added, never existed. While getting a glimpse of Yanukovych’s over-the-top extravagance, visitors to his villa are also told of how his successors are squandering the fruits of the revolution. “Old bandits have been replaced by new bandits,” said Petro Oleinik, a tour guide there. Defenders of the new leaders counsel patience. “They think everything can change in a day,” said Oleg Kuyavisky, an adviser to Vitali Klitschko, the former boxing champion who is now the mayor of Kiev. The struggle for control of Yanukovych’s estate, however, shows just how hard that will be in a country where who really owns what is often hidden in an opaque fog. Yanukovych and his cronies are gone, but government bureaucracies remain stacked with underpaid officials shaped by their corrupt ways. When Parliament first passed the law demanding that the state take over Yanukovych’s property, recalled Mr. Syrotiuk, the lawmaker who drafted it, it seemed an easy way to strike a symbolic and real blow against the corruption of the old government. “Everyone agreed we had to take it away, that this was not clean property,” he said. Doing this legally, however, quickly ran into problems as most of the estate was not technically owned by Yanukovych but by a private company that, on paper, had nothing to do with him. All Yanukovych formally owned was his palatial residence, a grotesque Finnish-built folly whose jumble of Italian, Gothic, Slavic and other styles is now mockingly known as “Donetsk Rococo,” a reference to the former president’s war-ravaged home city. A court finally ruled in June that the state had a right to take the whole property, declaring that a series of murky deals transferring the Soviet-era compound to private ownership were all illegal. But efforts to oust Mr. Tarachkotelyk have all come to nothing. The prosecutor general meanwhile has declared the entire property “material evidence” in a criminal investigation into Yanukovych, which means that nobody is supposed to touch it until Yanukovych comes to trial, an unlikely prospect as he has been hiding in Russia since late February. “This is all just a political game by people who want to take away Mezhyhirya for themselves,” Mr. Tarachkotelyk said.